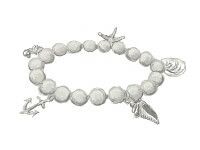 Charm bracelets and chain bracelets are hugely popular - and for good reason! DIY charm bracelets (and chain bracelets that incorporate other beading elements) are flattering, fun to wear and offer limitless opportunities for quick and easy customizations, enabling you to create beautiful, personalized bracelets. And, if you’re looking for quick and affordable beading projects that make great gifts, you can’t go wrong with personalized charm bracelets! Up until recently, most of the charm and chain bracelet designs we’ve made have incorporated beads or beaded charms, rather than pre-made charms for bracelets. While we’ve always enjoyed making charm bracelets for ourselves and our loved ones, we didn’t focus on beading tutorials showing how to make bracelets with charms because folks hadn’t been asking us for them specifically - until recently that is. So, due to popular demand, we’re in the process of making and adding a number of easy bracelet tutorials that show how to make charm bracelets, as well as numerous styles of trendy bracelets with words and other bracelet links that have special meaning.